Why do some kitchens seem so easy to work in while others seem hell? A kitchen layout can completely decide how much you will love or hate to work in your kitchen. Yes, layout can either work wonders or just double the workload of your kitchen chores. There are a few layouts that can be implemented depending on the space your kitchen has. G shape, L shape, U shape and island layout are commonly used layouts. A U shaped kitchen layout is useful in kitchens with good space and when more than person needs to cook. With a U shaped kitchen design, you can freely use ample of space in form of countertop area, basin or sink area and the worktop area. It also accommodates appliances like refrigerator, microwave etc. comfortably. A U shaped kitchen design actually works like a triangle, virtually. Basin or sink and worktop areas are usually parallel to each other while the countertop area is the middle portion. This allows ease of function as all the three sections are almost equidistant. The cabinet placement high up on the walls can also follow the same arrangement, although it is best to keep cabinets only over the cooking area, where most of your handy stuff can be accommodated. The worktop area should be kept relatively free of any kitchen ware so that it can be conveniently used while preparing food and also serve as temporary serving area in case you like self-service. The cabinets below the sink should be guarded against water spills that occur during dish washing and used for keeping more of cleaning tools than food items. Preferably arrange your sink parallel to the worktop area so that post washing of cut veggies or fruits, you can directly use them at cooking area. Regularly-used cutlery and utensil arrangement can pose some difficulties with so many cabinets in U shape, as you may have to run from one cabinet to another to place or find the desired cutlery or utensil. To avoid that you can have a vertical cabinet near the sink so that once they are washed and dried, they can be easily placed in that cabinet. The other sparingly used cutlery or utensils can then be safely stacked in other cabinets under the cooking area or worktop area. Ingredients that are usually used in cooking should be kept either at the worktop area or right in the cabinet below your cooking range to avoid too much running around and bending around the cabinets. Refrigerator and microwave positions are crucial as they are most frequently used while one cooks. Hence it is ideal to place the refrigerator and microwave on parallel legs of U shape. This is a convenient placement as most of the times one requires reheating of refrigerated food. Ensure that you arrange these two appliances at the end of these two parallel legs so that space in middle is not cluttered. With island: While U shape is a classic layout for most medium and large sized kitchens, one can also introduce a small leg in the middle or at the end of one of the legs if there is enough space in the kitchen. This serves as a small island and allows you to create a dining space and make serving snacks or food easier. So, what you get is a U shaped kitchen design with island. Ventilation is another important aspect while designing a U shaped kitchen. While the cooking range should ideally occupy the middle leg of U shape, do keep the ventilation factor in mind before doing so. Otherwise this shape can cause claustrophobic condition in the kitchen. Keeping a chimney ventilator over the cooking range is useful. Also, if you have a window on the base leg of U shape, it will be very helpful and make cooking easy. In case there is no window do ensure to keep a chimney ventilator. 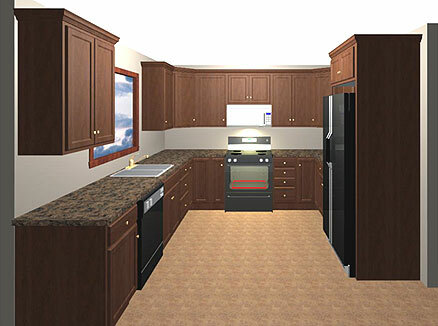 Online modeling of kitchen can be done with help of some sites, which helps in planning out where and what of your U shaped kitchen design. Before you fix it permanently, try designing your layout online to check for your kitchen’s feasibility. With a U shaped kitchen design, things are definitely easier to plan around. And since more than one person can easily function together without causing disruption to any of the areas you can definitely persuade your mate to work along! What better than that? What are your thoughts on U shaped kitchen designs? Do you have a suggestion or comment about designing a U shaped kitchen? Please share your thoughts with us by filling in the comment form at the bottom of the page. Thanks for the tips and ideas. They’re really helpful because I have a U shaped kitchen just like in the picture.